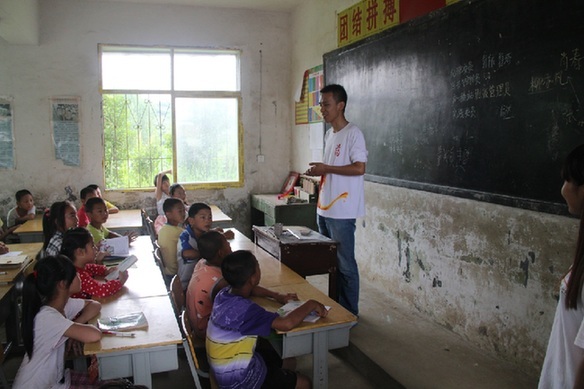 Rural schools in China's poor and remote villages face a severe shortage of teachers. Recent reports have found that 60 percent of the roughly 650,000 college graduates who hold an education degree cannot find a job at primary or secondary schools in urban environments in China. Simultaneously, rural schools in poor and remote villages face a severe shortage of teachers. How can this imbalance be rectified? Rural environments are not desirable posts for new teachers for many reasons. Sometimes existing teachers in these remote areas are poorly educated and hold their students to low education standards, thus making it difficult for new teachers with their fresh university standards to enter into a pre-established lower standard teaching environment. What's more, rural schools are often notoriously dilapidated and lacking in resources. All of these conditions contribute to new education graduates feeling reluctant to face the challenges of teaching in such compromised circumstances. And certainly, the problem is also financial. Poor, remote villages don't offer the same kind of salary guarantees that urban schools do. For students who have lived in urban environments throughout, at minimum, their education years, it's difficult to imagine going "backwards" when it comes to developing their personal financial portfolio. Since accepting a job in a remote area means accepting the lower wages offered, they aren't able to secure a financial footing to return to the city in the future. The Ministry of Education has a fixed number of posts that urban schools are looking to fill every year: approximately 250,000. The remaining 400,000 education graduates have several choices, including taking posts in rural schools, but many abandon their teaching dreams altogether. Some may take the less-travelled road of entrepreneurship and enter into the realm of tutoring or private education, but this doesn't offer any job security or old-age pension, which is often the reason a student has pursued the teaching profession in the first place. Regardless, these 400,000 unemployed urban graduates need solutions fast. So, too, do the rural schools. Therefore, brainstorming additional ways to make the available rural teaching posts more attractive must be a top priority. To their credit, the Ministry of Education has a program called "Voluntary Teaching" that is an incentive program for new graduates to spend time in rural areas establishing their teaching skills. In exchange for their willingness, the Ministry guarantees that these teachers will be placed at the top of the list for any urban jobs when they return to the city. To ease the shortage of teachers in China's rural schools, this writer suggests making half-year practical work experience in the countryside compulsory for a university education program graduate.